The purpose of this article is to provide our visitors with the best way to clean wood floors. With so many options to clean wood floors, it can be a difficult decision for the residential homeowner to decide what the best way to clean wood floors is. If you are a new visitor to our website – Keeping Floors Clean, you might want to look at other topics on how to clean floors. Our site is dedicated of finding the best way to clean floors, provide helpful cleaning tips, and supply our readers with a wide variety of ways to clean various floor types including wood floors. With this being said, the best way to clean wood floors is a personal choice but the Steam Floor Mop offers many advantages making it our number one choice as far as the best way to clean wood floors. If you’re not interested in using a steam floor mop to clean wood floors, please click on the following links to prior articles written about daily cleaning of wood floors and the do’s and don’ts of maintaining and cleaning hardwood floors(Cleaning Hardwood Floors Do’s and Don’ts and How to Clean Hardwood Floors – Simple Regular Cleaning). Green way to clean, since they do not require cleaning products – Only water is used to generate steam. No cleaning products mean a savings in money for the homeowner. They employ a microfiber pad which enhances and improves cleaning effectiveness. 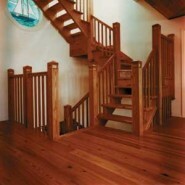 Safe to use on sealed wood floors because they do not over wet the wood floor. Always remember that wood hates water. The least amount of water on wood floor the better it is for preventing accidental water damage to the wood. Some Steam Floor Mop makes and models actually sanitize the floor.